As part of national policies for the conservation of marine biodiversity, marine protected areas are created in various ways in different countries. The specific Atlantic arc MPA database aims to provide an optimal (re)presentation of the diversity of approaches and tools. Below you will find a few keys to reading the datasheets and the map tool you can view on this site. 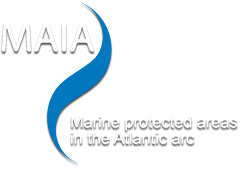 The Atlantic arc marine protected areas presented here comply with the IUCN definition and have national legal status as MPAs; this is referred to as 'national designation’. In any given geographic area, several complementary ‘designations’ may have been made over time, each one meeting a specific conservation aim. To give a true picture of this complex reality, each ‘designation’ has a datasheet and is represented on the map tool. To have a full and fair view of protection in a given area, the other MPAs intersecting with the initial territory should be consulted as the ‘designations’ and their effects are complementary (management plan, regulations, available resources, etc.). The diagram below shows this situation using fictitious designations and perimeters. Diagram of the possible overlaps of designations (please note that these designations are not real). When you consult an MPA datasheet, also look at the MPAs listed on the right-hand side in "Other MPAs in the area" for a complete view of management in the territory. and possibly specific management objectives. Sub-perimeters often correspond to areas where protection is reinforced. A marine protected area may have one or more sub-perimeters. The diagram below represents this situation with fictitious perimeters. When you consult an MPA datasheet, also read the main perimeter and sub-perimeters tabs. The information that differs between the main perimeter and the sub-perimeters is highlighted graphically. Feel free to browse from one tab to another to understand all the differences. Je viens de consulter cette page, http://www.maia-network.org/homepage/marine_protected_areas/keys_to_reading, je te la conseille.